Cheesecakes are the one thing that I never seem to get right. Granted, I have never attempted to make a basic cheesecake I usually go with flavorful ones like pumpkin cheesecake, tiramisu cheesecake, and so forth. When I come to think of it though the pumpkin cheesecake I made wasn’t that bad it was just really dense. 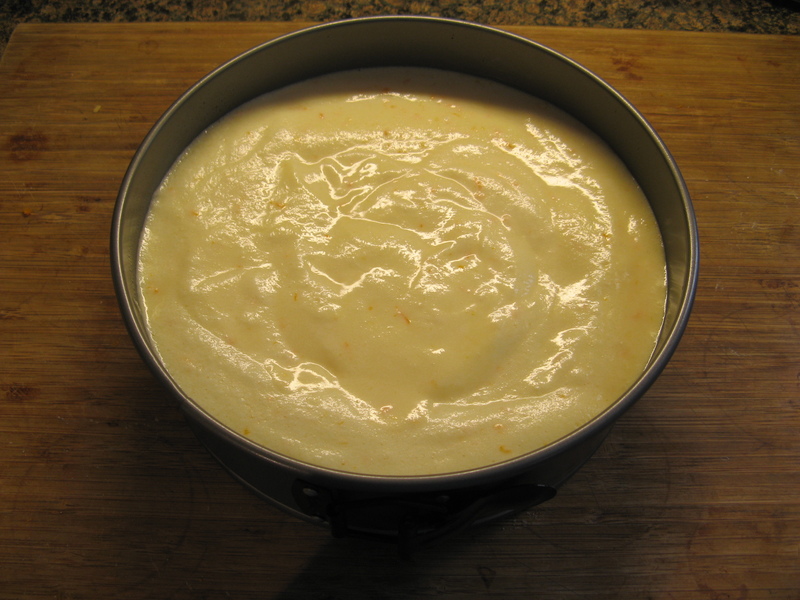 I decided to give it another go when I came across a cheesecake recipe in the March 2013 issue of Food Network Magazine – appropriately coined The Cheese Issue – called Ricotta Cheesecake with Almonds. I usually love anything made with almonds so I knew this would be a hit for me. To begin, I toasted sliced almonds – 1/4 cup for the crust and another 1/3 cup for the topping – in a 350 degrees preheated oven for 5 minutes. I used to skip over toasting nuts whenever I saw it in a recipe but have to come to realize that toasting them definitely enhances their flavor. Once the almonds were cool I made the crust for the cheesecake. 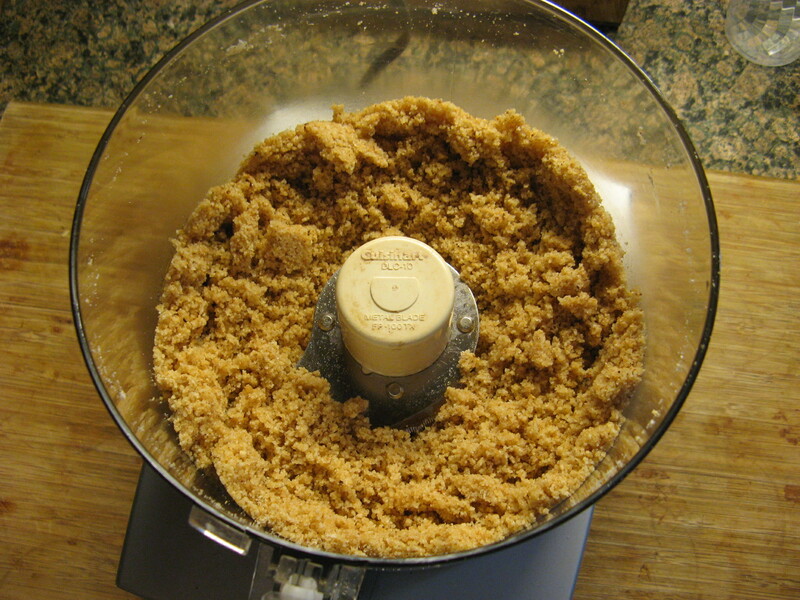 I combined the almonds, almond biscotti and granulated sugar in my food processor and pulsed the mixture until it was finely ground. 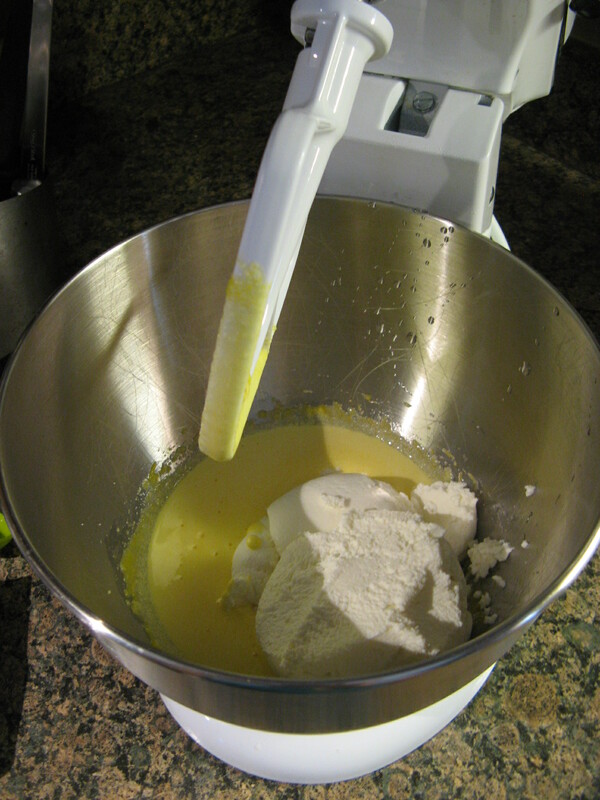 I then added melted butter and pulsed for a few more seconds so the mixture could come together. Once it did I pressed it into the bottom of an 8-inch springform pan and baked it in the oven for a little over 10 minutes so it could set. While the crust was in the oven I did some prep work for the filing. I separated three eggs and used a Microplane to zest an orange. After I removed the crust from the oven I let it cool on a wire rack and lowered the oven temperature to 300 degrees in preparation for baking the cheesecake. 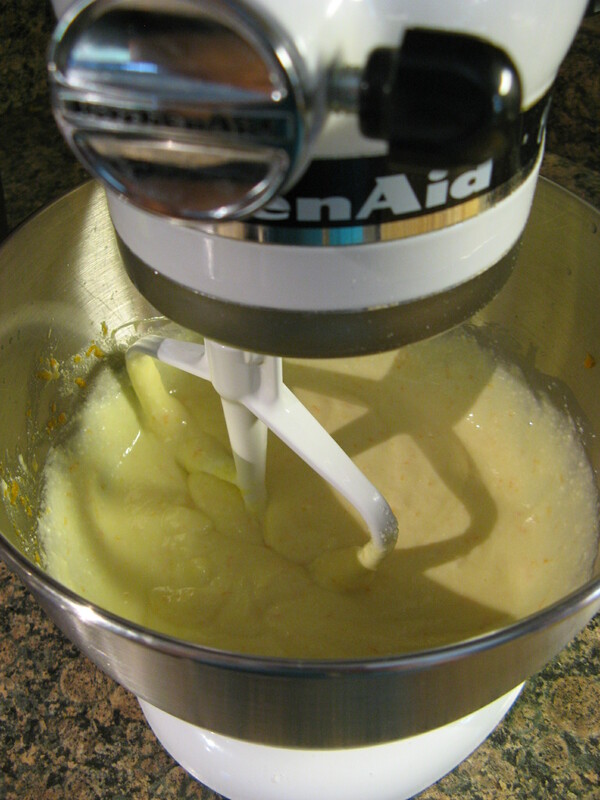 To make the filling I started by beating the eggs yolks and sugar on high speed for about two minutes until the mixture was a pale yellow. I then added in ricotta cheese and beat this for another two minutes until it was smooth. 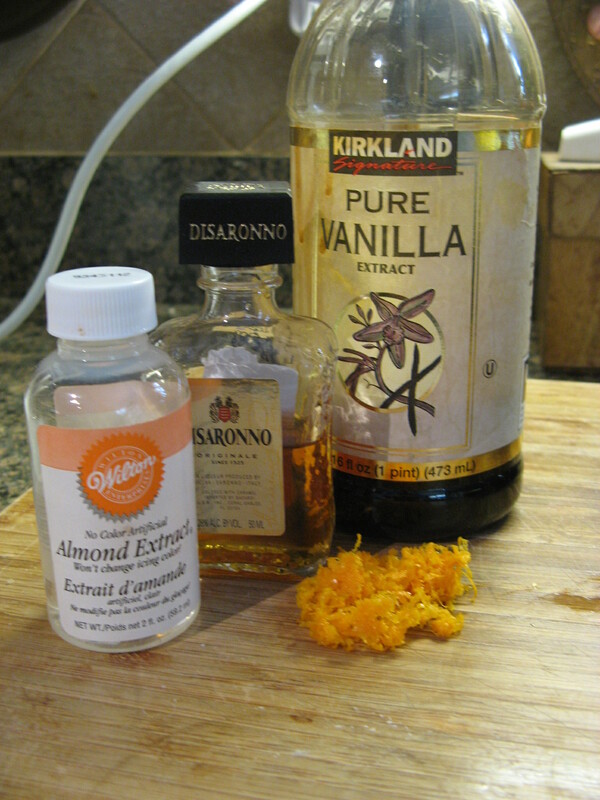 And finally I added in almond & vanilla extract, amaretto liqueur and the orange zest. I put that part of the filling aside and beat the egg whites with sugar until soft peaks formed. 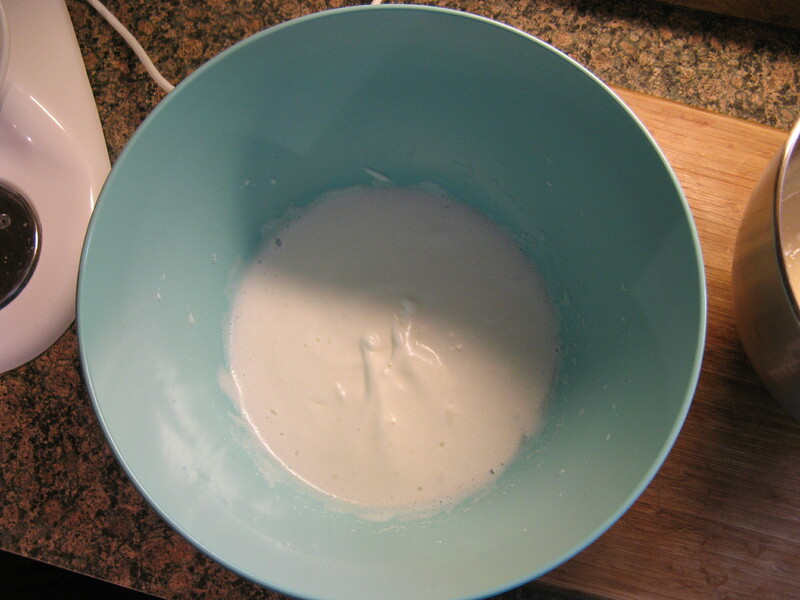 To combine the two mixtures I began by folding in 1/3 of the egg white mixture into the ricotta mixture. I then folded in the rest until the two were just combined. After all the pulsing, mixing and baking I finally had my crust and filling ready. I poured the filling into the crust and baked it for 1 hour 10 minutes. 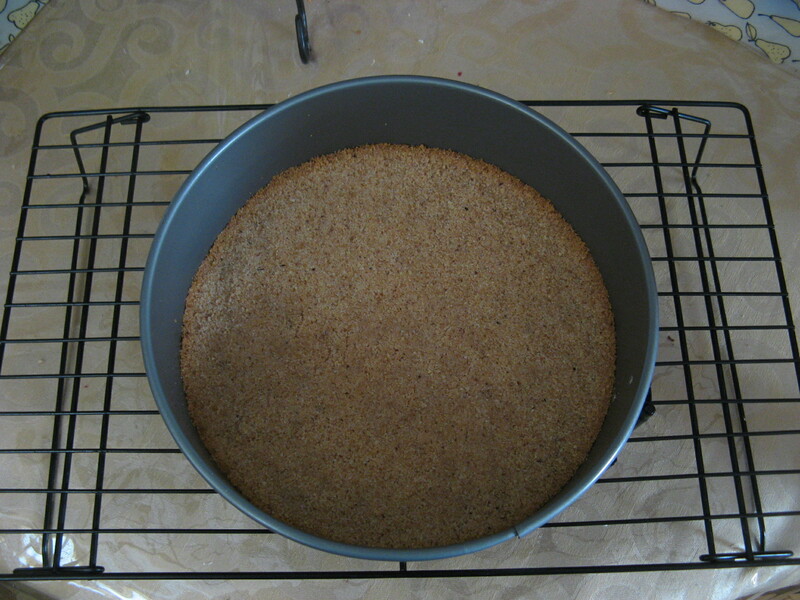 I opted to reduce the baking time by 10 minutes from the directions since the cheesecake looked done according to them – slightly puffed and lightly golden on top. I let the cheesecake cool for 20 minutes on a wire rack and then removed the springform ring after running a knife around the edge of the cake to loosen it. Once the cheesecake was completely cooled I added the topping. 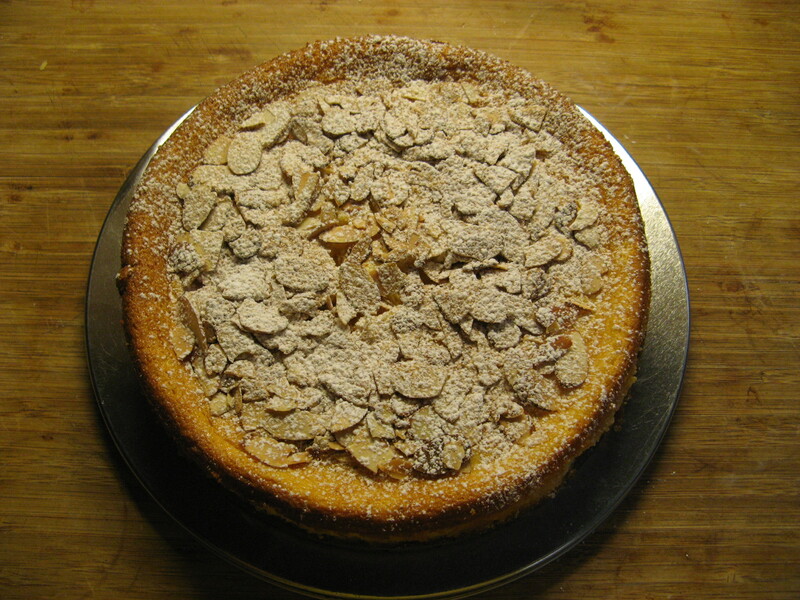 I sprinkled cinnamon and confectioners’ sugar over the cheesecake, then spread out the 1/3 cup of almonds on top of it and then sprinkled more cinnamon and confectioners’ sugar over the almonds. This was a cheesecake success! I will say though that while the recipe name made it seem like almonds would be the dominant flavor that was only the case with the crust, the cheesecake itself really took on the flavor of the orange zest even though there was amaretto and almond extract in it. Either was it was delicious! Make the crust: Position a rack in the lower third of the oven and preheat to 350 degrees F. Spread the almonds for both the crust and topping (1/4 cup plus 1/3 cup) on a rimmed baking sheet and bake until golden, about 5 minutes. Let cool. 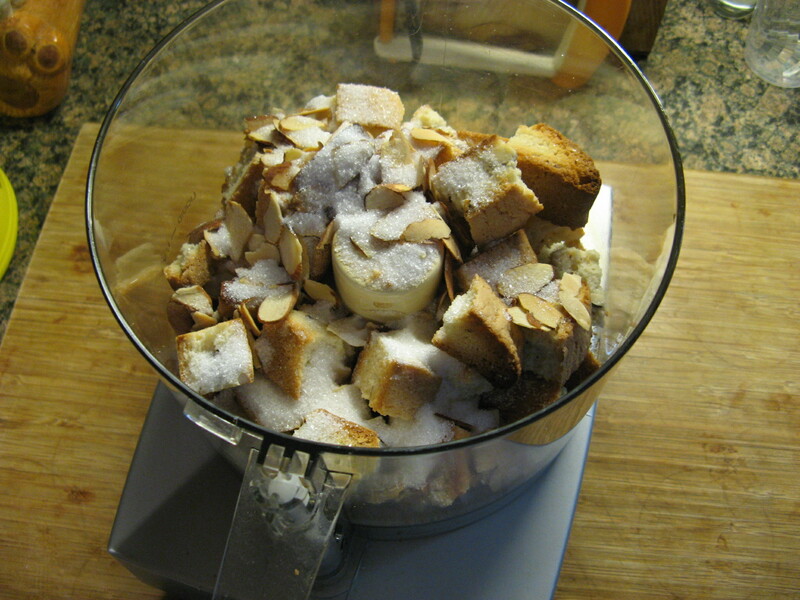 Crumble the biscotti into a food processor; add 1/4 cup toasted almonds and the granulated sugar and pulse until finely ground. Add the butter and pulse to combine. 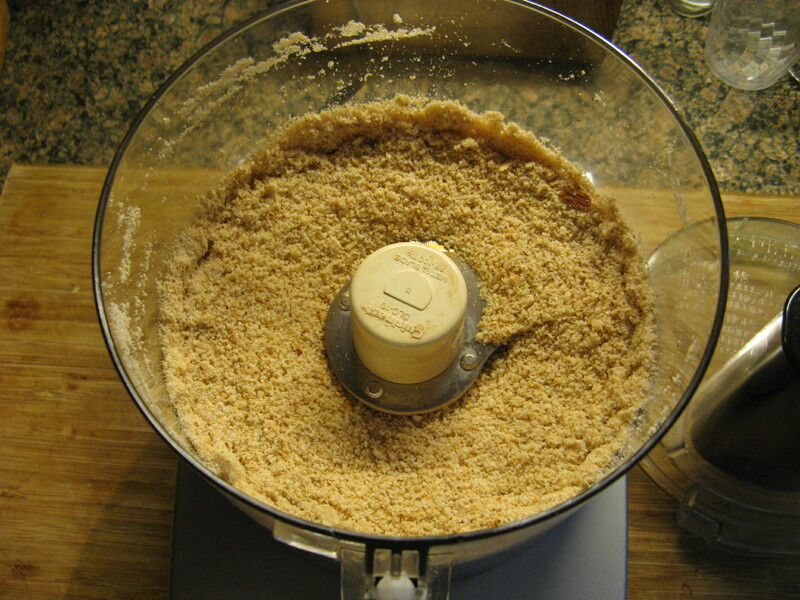 Press the mixture into the bottom of an 8-inch springform pan. Bake until set, about 12 minutes, then transfer to a rack and let cool completely. 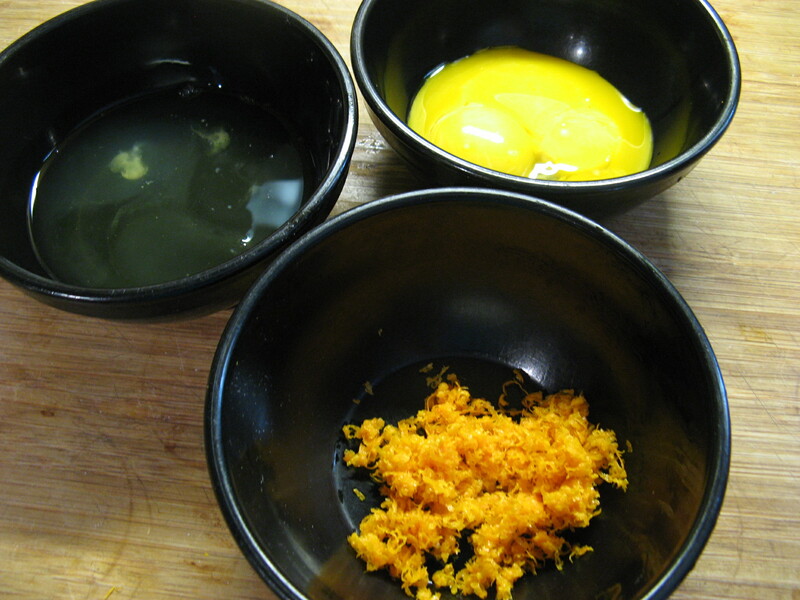 Reduce the oven temperature to 300 degrees F.
Meanwhile, make the filling: Beat the egg yolks and 1/2 cup granulated sugar in a large bowl with a mixer on high speed until pale, about 2 minutes. Add the ricotta and beat until smooth, about 2 more minutes. 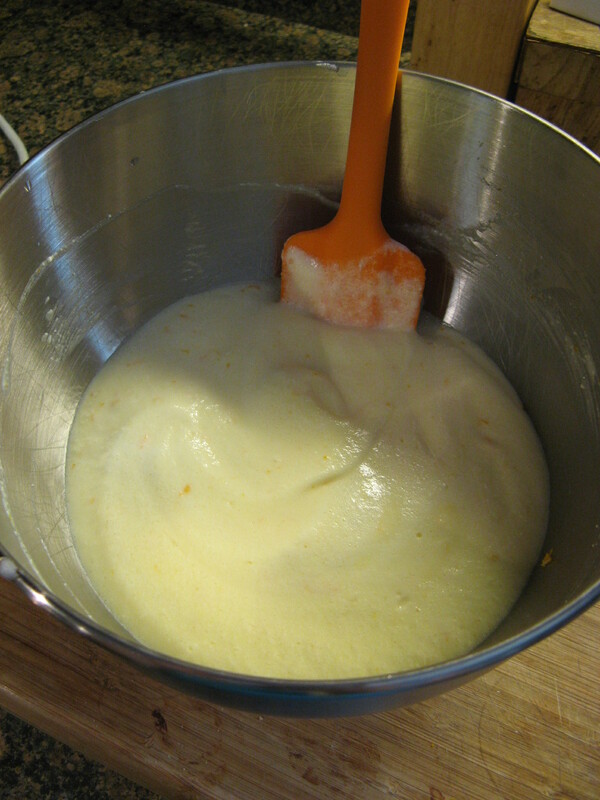 Beat in the amaretto, vanilla and almond extracts, and orange zest. 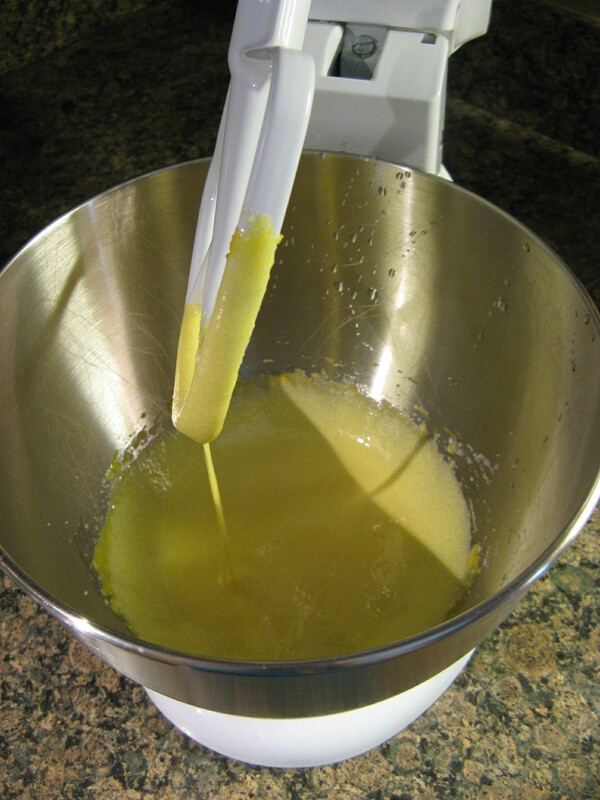 Put the egg whites and the remaining 2 tablespoons granulated sugar in a separate bowl and beat with a mixer on medium-high speed until soft peaks form (do not overbeat). Using a rubber spatula, fold about one-third of the beaten egg whites into the ricotta mixture, then gently fold in the rest until just combined. 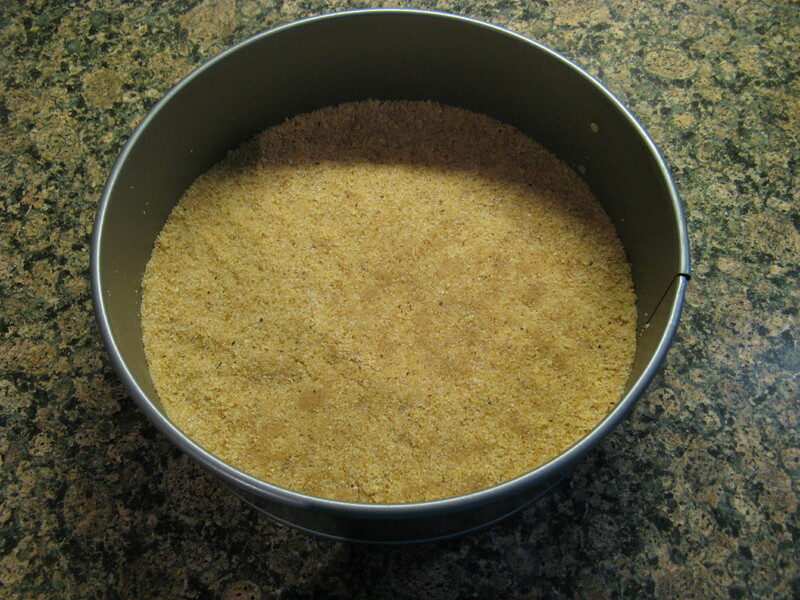 Scrape the batter into the prepared crust. Bake until slightly puffed and lightly golden on top, about 1 hour, 20 minutes. Transfer to a rack and let cool, 20 minutes. Run a knife around the edge of the cake to loosen, then remove the springform ring and let cool completely. 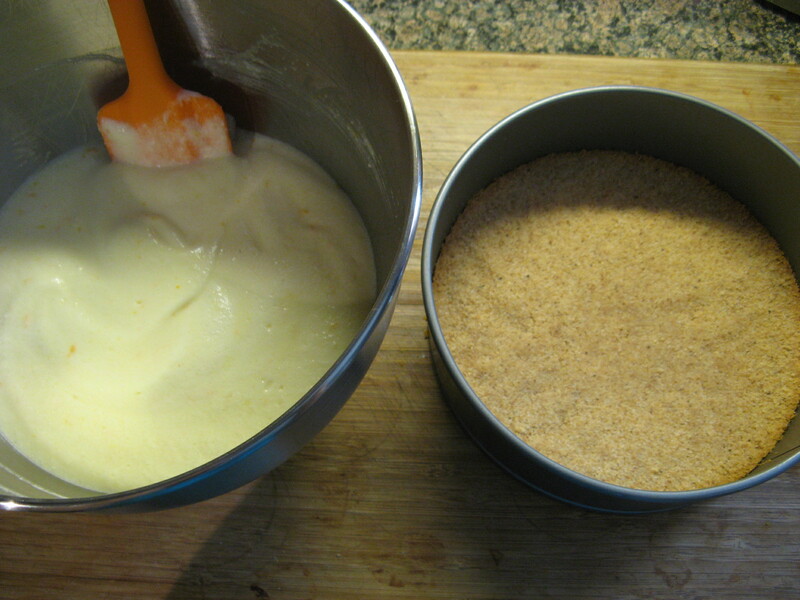 Combine the confectioners’ sugar and cinnamon in a fine-mesh sieve and dust over the cheesecake. 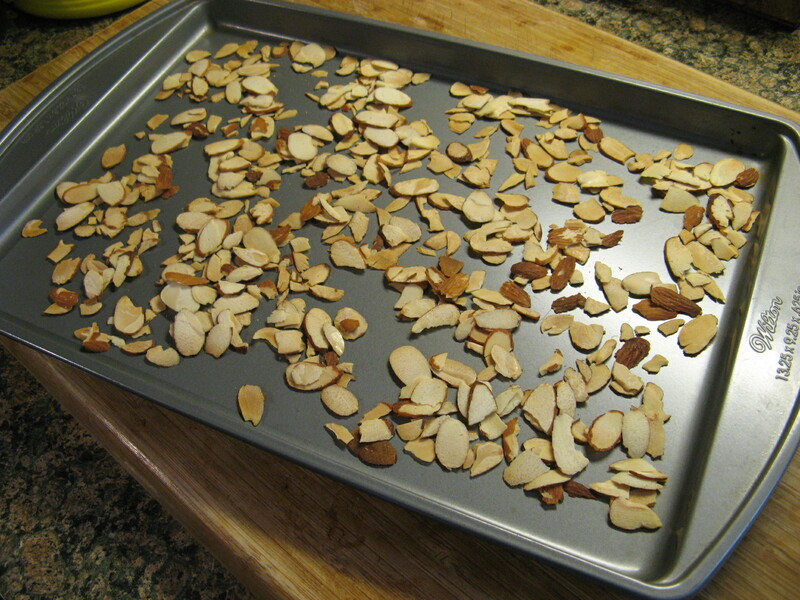 Scatter the remaining 1/3 cup toasted almonds on top and dust again. Serve at room temperature. *5 ounces of biscotti is equivalent to about 8 pieces. I actually used Stella D’oro Almond Biscotti which conveniently came in a 5.5 ounce package. this looks delicious! I have had no luck with traditional cheesecake, but you make it seem like this is a nice alternative to it! I love the almonds on top! Thanks! Yes, this was definitely a good alternative to traditional cheesecake. I think making it with ricotta cheese as opposed to cream cheese makes all the difference. This was definitely a winner. I can’t wait to read about your cheesecake baking adventure on your blog. That looks so delicious! Cheesecake is one of my favorite desserts! Thanks! Cheesecake is high on my list of favorite desserts as well. Cheesecakes are always my favourites!